The E.L.F studio kabuki is quite big and fat. The bristles are really soft to the touch. It's not dense but still well packed. Love the brush on the face because it's just so soft. Had been using it for quite a while and I really like it. Would prefer it for buffing finishing powder instead of powder foundation cos the coverage it gives is on the sheer side since it's not dense enough. I totally adore this brush now. Didn't try it for the longest while since I was hooked to the Powder Brush for blush application. Wished I did so earlier soI could order more. The E.L.F Studio blush brush is quite a tiny brush (for a blush brush). It's really small with a rounded head. It's a flat brush. This brush is really good for precise blush application, when you just want the blush to go on the apples on your cheeks etc. I tested it with mineral blushes and pigmented blushes and it picks up just the right amount without making the face overdone. Love it to bits. However I don't like to use the brush for blending. You might want to use any brush to blend out the brush as it gets it done faster. Have yet to use this brush for applying contour. I should be trying soon. This brush is really soft. I really like the touch of it and how cute the head looks. The head is dome-shaped. Ok, as a contour brush, I find it's only all right. The bristles are too short if you want to use it for defined crease application. The ferrel, on the other hand, is too wide and circular for the bristles so they protrude out a little more. When applying eyeshadow in the crease, the ferrel can be kind of scratchy, especially if you are planning to dig the brush in deep to the socket and blend.. It's not very pleasant. 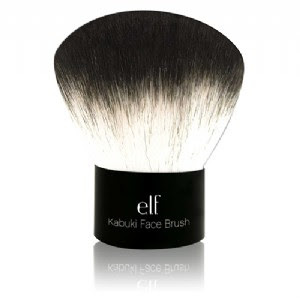 If you want to use it blending, it doesn't do as good a job as the E.L.F blending brush from their regular US$1 line. The feeling of it brushing to and fro feels spongy. However, I think it works well as a pencil brush. It's good for applying eyeshadows precisely in corners, on the lid, or under the lash line. Light blending is all right, just not when you need to blend at the crease line to get a defined crease. They should change the name of it. I think your makeup entries are very very helpful! thanks!! !